Everyday objects leap off the cards when players wear their oh-so-cool 3-D glasses. 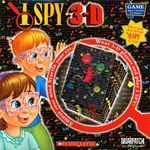 Players read rhyme cards and search to find floating objects that they can almost touch on a colorful game board that they create using 40 3-D tiles and 10 rhyme cards. By mixing up the tiles, no two game boards are alike. Collect the most tiles to win. For 2-4 players. Complete game rules are included. Ages 5+.